He said some girls did it. I had to take care of a personal matter, so I explained to him that we have to be quiet. He understood. He tapped me on my arm and said “daddy can we leave”. When I looked at him, there was terror in his eyes. He was visibly scared of something. He even pointed to his ninja and said ‘daddy even he his scared. We left the church and I told him that we can go to his favorite store, he got real excited. He lead the way and we wound up at 34 South 11th St I explained to him what this building is and what happens in there. We have a little chant that we say when ever we go near that building. On the way to the Gallery we ran in to poles and bounced off them, he really loved doing that. (And I do too!) People were laughing and watching us bounce of them. Wandering through the Marriott, he had his cars in hand and ran them up the walls, the sides of the escalator, and surface that was in arms reach. Coming down the escalator, he saw Dunkin Doughnuts and wanted a chocolate one and was VERY specific about what he wanted. We got a cup of holes and headed to Burlington Coat Factory. The usual tour all 3 floors in and out of the isles. When we do that I point out different things or he will ask “what this daddy” And I explain what it is and all the ways you can use it. Heading out of the store we were hit with the smell of fresh popcorn, and he wanted some. Following the scent, I tried to let him lead the way and he almost made it. 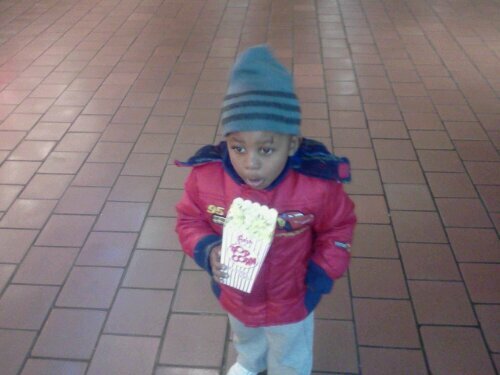 Popcorn in hand, we were off to my brothers. When I came in with his lunch, I was greeted with “daddy daddy” and a big leg hug. We sat down to eat, but he was preoccupied. My brother just got a new sofa and he wanted to see. After going back and forth on when he can get up, he finally ate what he had to and went to test out the new sofa. It was Ajani approved! Bouncing off and on to the floor, he had a ball! And played till it was time to go.